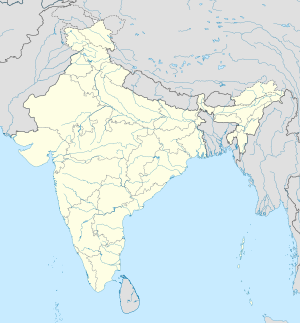 Jaynagar Majilpur (or Jaynagar) is a city and a municipality of South 24 Parganas district in the Indian State of West Bengal. It is in the southern suburbs of Kolkata. The city is in the area of Greater Kolkata. It is a part of the area covered by Kolkata Metropolitan Development Authority (KMDA). The city is famous for the confectionery called Jaynagarer Moa. Jaynagar Majilpur city is located at 22°10′38″N 88°25′33″E﻿ / ﻿22.1772°N 88.4258°E﻿ / 22.1772; 88.4258. The average elevation of this city is 8 metres (26 ft). During the 2011 Census of India, there were 25,922 people living in Jaynagar Majilpur. 13,234 (51%) of the people were were males and 12,688 (49%) were females. There were 2,277 people younger than 6 years old. There were 20,898 (88.38%) people who were older than six years old who could read. ↑ "Base Map of Kolkata Metropolitan Area". Kolkata Metropolitan Development Authority. Archived from the original on 28 September 2007. Retrieved 3 September 2007. ↑ "Falling Rain Genomics, Inc - Jaynagar Majilpur". Falling Rain Genomics. Retrieved 27 August 2016. This page was last changed on 13 February 2019, at 09:55.